Kate Bush articles until, well, there is cause to celebrate an album, new or old. In fact, it is important we mark anniversaries regarding her music. Today, I look ahead to tomorrow because it is an important day in her history. On 3rd April, 1979, Kate Bush started a twenty-two date tour, her first-ever, at the Liverpool Empire – she did a warm-up concert the night before. She would then embark on a six-week tour of Europe with the show and brought her music to fresh faces. Given the fact that Kate Bush’s debut album came out the year before – The Kick Inside – one could forgive her for producing a debut concert that was a bit basic and just got the hits out. 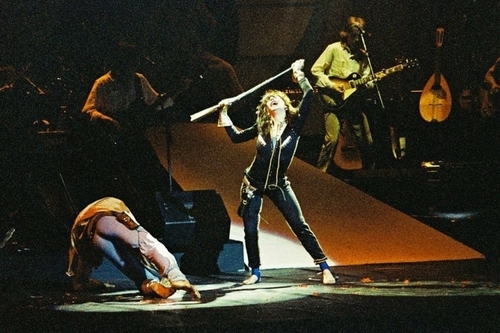 The Tour of Life (also officially referred to as the Kate Bush Tour) was her performing songs from her first two albums – Lionheart also came out in 1978. There was a lot of talk and excitement regarding Bush at this point and, invariably, people wanted to see her on the stage. Of course, 1978 was a mixed year. She achieved her dream by releasing an album. In many interviews Bush has talked about that desire she had regarding just having an album out in the world. If she has somewhat distanced herself from The Kick Inside – claiming it was a bit airy-fairly and not as raw/masculine-sounding as she’d hoped; a need for more control over her musical direction – Lionheart was a fast follow-up and an experience she did not really enjoy. That might sound like a rather cold and unappetising recipe for a concert series that lacked heart and meaning. Rather than being a disappointment and something Kate Bush was being forced into, she took to the project with determination and passion. I shall end with her second-ever tour/series later but, in 1979, there were very few artists doing what she was doing. David Bowie and others were bringing characters and something theatrical to the stage but nothing that rivalled Bush’s concept. One can claim Bush helped engineer the wireless microphone because, as she would be live and dancing throughout the show, she would not be holding a microphone. Pop artists since have been using this technology to ensure they could produce a more energetic, physical and ambitious show! During the Tour of Life, Bush fused magic, mime and high-drama to give the audience something spectacular and unique. Look at the videos – rather grainy and scratchy – from that tour and you marvel at the costume changes and the sets for each song. It was not a case, like many artists today, where there is this rather routine performance and the focus is on the song itself. Bush created this little world for each song and ensured that the visual aspect was as important as the sonics. Indeed, rehearsal and documentary footage shows she was determined to make the songs as tight and down-pat as possible. If there was a wrong note or drum fill out of place, she would let her band know! She was paying the wages and, for that reason, she could not have it go wrong! There was a brutal regime when it came to getting everything figured. The band and Bush were working five-day weeks for six-to-eight weeks. She was rehearsing her choreography at The Place and then convene with her band at Wood Wharf Studios, Greenwich in the afternoon - continuing her practice and dance back at her flat late into the night. Fans and the media knew what The Kick Inside and Lionheart sounded like through their record players and realised that this special and promising young woman was making some truly beautiful and original music. Apart from that, there was not really much known. How would she bring these albums to the stage and would this relatively new musician be able to cope with such a grand and multi-layered production?! Not only did critics rave but the audiences packed in to see this bonanza! She made sure members of the Kate Bush Club got tickets but, through its run, there were barely any empty seats. From the Tour of Life, there came the E.P.s On Stage (1979) and the video, Live at Hammersmith Odeon (1981) – an important part of London that would play a role in her 2014 return to the stage. This was not the only time Bush had the chance to bring her music to a wider audience. She was offered the chance to support Fleetwood Mac at the end of 1978 but she knew that their tour support slot would not be right. She’d not be able to express herself in the way she wanted and have enough time to give a proper performance. I look at the footage of Bush and her band rehearsing for the Tour of Life and a lot needed to be ticked and perfected before they stepped onto the stage. A lot of the rehearsals revolved around Bush’s band getting to grips with the song structures and adapting from the studio to the stage. Twenty-three songs were penciled in from Bush’s first two albums - Oh, to Be in Love was the only one not included on the set-list. James and the Cold Gun (The Kick Inside) was the end of the main body of the show; a wonderful set-piece where Bush was ‘gunning down’ dancers in this dramatic interpretation. There was debate how to get the effect of blood. The idea of using film blood was mooted but that left pink stains on the ramps/set and was not deemed practical - red silk was used until the final night when, naturally, they had just cause to go for it! Bush had a say when it came to fabrics and set; she was in on all aspects and not a performer who was at the centre and let everyone make the calls. In other ways, she changed the role of musicians in live shows and gave them a voice. Various members of the tour crew - including the set designer, David Jackson - noticed how Bush had a very dogged and determined style of management that was quite intense and, at times, confrontational. This was the first real occasion when Bush allowed a degree of autonomy and, as it was her music, there was responsibility at her feet. Certainly, the Tour of Life offered this new world for artists. Rather than having a basic set and performing in a very straight way, there was a chance to open the imagination and utilise technology at the time. Her Tour of Life wanted something theatrical and moving to contrast the usual style of Rock musicians of the 1970s. Not only was her use of a head-mic unique but she performed using playback - unheard of in the 1970s. Soon enough, big artists brought their tours to stage and followed Bush’s lead: David Bowie (Serious Moonlight/Glass Spider), Prince (Lovesexy); Madonna (Blond Ambition) and U2’s Zooropa had threads and elements of Kate Bush’s theatrical and groundbreaking tour. Music, poetry and the biblically eye-opening mixed alongside one another in a four-section show that took the audience through her first two albums. Rather than rattle off the hits and do things chronologically, Bush created this immersive, sense-awakening show that boasted some of the most ambitious sets and performances up until that time. It is hard to overstate just how ground-breaking the Tour of Life was and what it did for music. There were artists providing these big sets and shows but, in terms of Pop solo artists, this was unheard of. Look at artists who followed Kate Bush – such as Madonna and Britney Spears – and how you can see the Tour of Life’s elements in their work. Bush, modest as ever, did not expect the rapturous reception and seemed a bit shocked by all the positivity. She had worked hard on putting together her first tour and it paid off! It is no surprise that the tour was a success after the effort and money invested. Although EMI (the record label Kate Bush was signed to) was not involved, the tour still cost up to £250,000 - an eye-watering sum in 1979! There were battles with budgets considering Kate Bush’s scope. She was fitting these epic sets into smaller venues. Whether it was lighting or set design, compromises had to be made but Bush was determined not to be steamrolled. The tour itself almost didn’t happen. Following a warm-up gig at Poole on 2nd April, the lightning engineer, Bill Duffield, was killed in a freak accident. He performed a ‘dummy check’ where he ran around the venue to ensure nobody was left there and there were no bags/bits of kit etc. the crew had forgotten. It was quite dark and he fell from a seating structure in the venue. There should have been warning lights and barriers; there should have been signs but, when trying to step onto a ledge that wasn’t there, he fell onto concrete and died in hospital. It was a tragic accident and one that should not have happened. Kate Bush was, naturally, distraught and considered calling off the tour. She later wrote the song Blow Away (for Bill) in memory of Duffield and the first of her three London dates was a benefit concert for Bill Duffield. There were so many positives from the tour and, in spite of a raw tragedy and loss, there was more good than bad. Critics heralded this staggering artist who had created something unlike anything else! The concept of live performance would change and, whether she knew at the time, Bush was able to inspire and guide legions of other artists. Every interview since 1979 seemed to focus on one thing: whether Bush would ever perform again. That was not the only question people were interested in but she could not dog that demand and speculation. Having produced such a celebrated and wonderful first tour, everyone was keen to discover whether Bush would follow it soon. Few realised how much energy Tour of Life took out of her. Even from a performance perspective, she was drained every night. There were moments when crew almost had to carry her off stage (at the end) because she was wiped and had put so much of herself into the show. This was what she wanted but there was not a lot of chance for Bush to party and socialise after the show because of fatigue. She became used to flying pretty soon but was not a fan of it early on. International commitments were part of her career but something, one feels, she did not always enjoy. Maybe another tour would demand she played around the globe and, in terms of physical demands, that would be a huge ask. Given the tragedy surrounding Duffield, that had taken its toll and she did not want to see that happen again. Also, the effort and imagination needed to put the Tour of Life together was huge and she could not simply trot out another show like that! Bush committed herself to albums after 1979 and did do T.V. performances and the odd bit here and there. She loved doing the tour but it was very demanding on her time and body, and so, going through all that again was not as attractive as one might suspect. Bush, in 1979, also wanted her work to be taken seriously and be seen as a serious artist. In the studio, engineers and producers were as much a part of the work as she was: touring allowed a sense of freedom and expression she had not been afforded by EMI/those who guided her first two albums. As I said, every journalist was asking whether she would tour again and, even when promoting 2011’s Director’s Cut/50 Words for Snow, that question kept coming up. She deflected it by saying that she had no plans and that, yes, she enjoyed her 1979 tour – she was not sure whether she would play again but was always open to it. It was a shock to everyone to see her on stage in 2014, at the Hammersmith Apollo, to perform Before the Dawn – some thirty-five years since Tour of Life. Unlike that debut tour, this was more of a residency: Bush was at the same venue for the run of dates but the concept/ambition of the show was no less impressive. Whereas Tour of Life took from Bush’s first two albums, Before the Dawn focused on the song suites from Hounds of Love (1985) and Aerial (2005). I was not lucky enough to get a ticket for the show(s) but everyone who went was seduced and stunned. Taking mainly from Hounds of Love’s The Ninth Wave and Aerial’s A Sky of Honey, she did sprinkle songs from other albums in the mix – although she overlooked her first couple of albums (she could not fit everything in and did not want to repeat herself). Bush’s son, Bertie, was largely instrumental in getting his mum back on the stage. He inspired her album, Aerial, and there were reservations from the icon. “While it’s tempting to look at this as an endpoint — a final and well-deserved victory lap — Bush has described this album as “a rather big comma.” This isn’t the end, apparently, and nor should it be. If anything, Before the Dawn is living, breathing proof that Bush still has the creative prowess and unique sensibilities that made her a superstar in the first place. Like most live albums, this is not essential listening for new or casual fans. However, for dedicated fans, both those who could and could not attend the run of shows, it is a reminder of the still very potent lust for life that Bush has always exhibited in her music, art, and personality. It’s a reminder that fear can be conquered in the most ambitious and uplifting way, that fear does not define who we are”. Questions will circulate, even now, whether there will be another tour. She has not released another studio album since 2011’s 50 Words for Snow so we are waiting for that. I suspect there will be something coming in the autumn but cannot be sure. She is now sixty and, whilst peers her age are still on stage and performing high-octane shows, where would the material come from? Which albums would she take music from and would she be up for another exhausting and time-consuming show? My suspicion is that we will never see another tour/residency because of all of these factors. Maybe she will change her mind but I do feel that there will be albums from Kate Bush but no more gigs. One can never predict with her and say where she might head. We could not predict Before the Dawn and nobody expected anything as grand and memorable as the Tour of Life back in 1979.